Muscat: A feeling of uncertainty gripped Sohar, 230-kilometres north of Muscat on Sunday, as at least one person died and more than a dozen were injured after a protest turned violent. Some news agencies have reported two people were killed. Witnesses speaking with Reuters said about 2,000 protesters had gathered for a second day in a square in Sohar, on the north coast, before police tried to disperse them, first with tear gas and batons and then rubber bullets. "Two people have died after police fired rubber bullets into the crowd," one witness, who declined to be named, told Reuters. 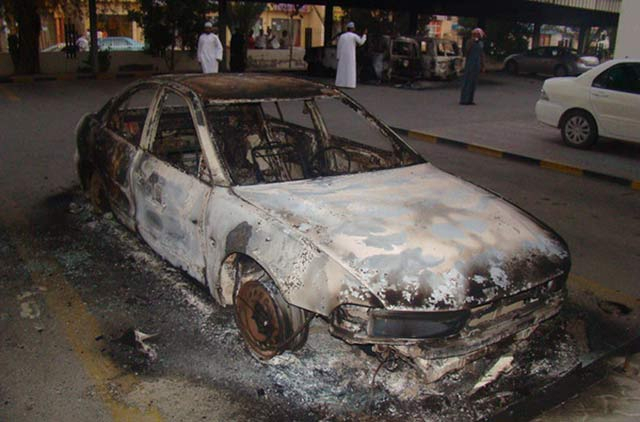 "Some vehicles near Labour Department and Municipality offices were set on fire," a long-time Oman resident expatriate told Gulf News on the condition of anonymity. "Neither police station nor any government building is on fire," stressed the expatriate. The unfolding incident at first got residents curious, but as the clashes worsened, people began hoarding essentials for fear of unavailability due to closures of most major supermarkets. A medical worker from Sohar confirmed that security forces used shells and tear gas to quell a violent mob that had completely blocked the Pearl Roundabout. Maitham Musawi, a medical student, tweeted that he saw people with gunshot wounds. He tweeted: "CONFIRMED: 12 injured and 1 died in Sohar hospital most of them from gunshot wounds, 2 r in surgery." He also tweeted that protesters surrounded the police station in Sohar demanding the release of protesters arrested yesterday. Referring to protesters, he wrote: "They burned a ‘gas truck' in protest near the police station! That's when the shooting started." 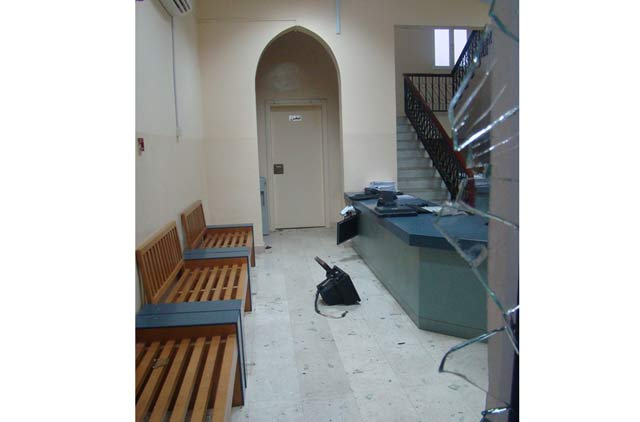 A medical worker told Gulf News that people with minor injuries were being treated at the old hospital. According to the Oman News Agency, a number of demonstrators in Sohar were involved in riots that led to the destruction of a number of public and private properties. Police and anti-riot groups combated this group — in a bid to ensure the safety of the citizens and their properties — which resulted in some injuries. Protests also took place in the southern town of Salalah where a small number of demonstrators have camped out since Friday near the office of a provincial governor, Reuters reported. - Oman is the oldest independent state in the Arab world and has been ruled by the Al Saeed family since 1744. Although an oil exporter it is not a member of Opec. - Sultan Qaboos Bin Saeed, 70, became Sultan in July 1970 after deposing his father in a coup. - He appoints the cabinet. In 1992, Sultan Qaboos allowed a parliament called Majlis Shura. - Oman produced around 860,000 barrels of oil per day last year. - The economy grew by a faster-than-expected 6 per cent in 2010 and robust crude oil prices enabled Oman to overspend on its 2010 budget. - Population: 2.7 million, 70 per cent Omani nationals. - Ethnicity: Arab, Balochi, East African (Zanzabari), South Asian (Indian, Pakistani, Bangladeshi). - Religion: Muslim 86 per cent, Hindu 13 per cent, other 1 per cent. - Geography: 300,000 sq km, with 1,700km of coastline on the Gulf of Oman and the Arabian Sea.